Exotic Pools pride themselves on providing affordable excellence in hand with meeting the individual desires of their clients. Each of their designs complements their surrounding environment to create an overall look of aesthetic synergy. The owners of the featured pool wanted it to be accessible for exercise and family fun, as well as being a suitable entertaining area. 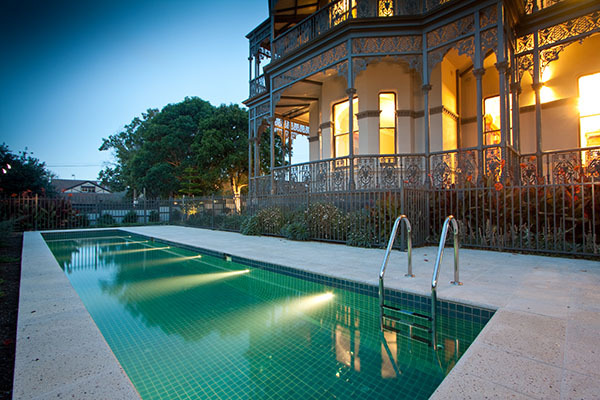 Being situated at the front entrance of the house, the pool’s aesthetic appeal was strongly influenced by the serene setting of the well designed garden, as well as subtly complementing the owners’ magnificently restored 19th century mansion. The end result is sleek and classy. Simple lines in the design reflect the mature style of the architecture of the home. The tasteful use of six Lumascape LED lights creates a lustrous glow across the 12m stretch, brightening the front of the residence. Exotic Pools worked in conjunction with Michael Malacos of Malbac Construction to create a design that fully accommodates the owners’ desires. The pool allows the owners and their guests to enjoy the tranquil surroundings of their front garden while relaxing in this stylish centrepiece. 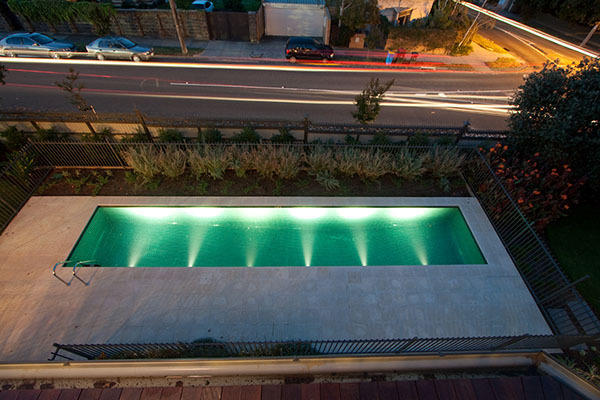 At the same time it functions suitably for its purpose as a lap pool, with just enough width of 2.4m. The owners wanted the pool at the front of the home to maximise the use of the land at the rear for a tennis court to add to their energetic lifestyle, and its fit was perfect. Exotic Pools made sure that pool cleaning will never be a worry for the owners with the use of an inbuilt Quickclean in-floor cleaning system and automatic chlorine and pH controller. Two skimmer boxes and four returns were also installed for better surface cleaning. To meet regulations, Exotic Pools installed decorative tubular steel fencing with the design as well as in other parts of the house to create an integrated look. This way, family fun is made safe and suitable for all ages. Exotic Pools have been creating custom indoor and outdoor in-ground concrete swimming pools and spas for over 18 years. 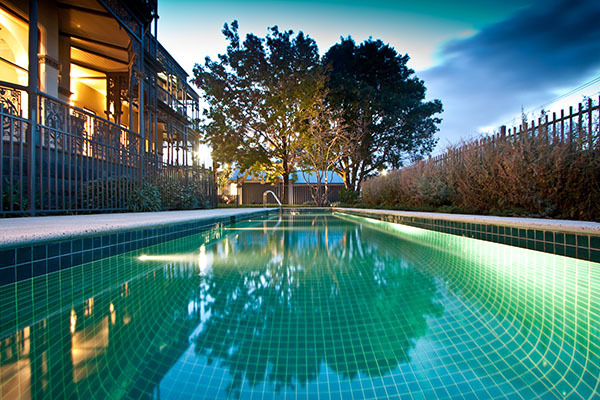 With their breadth of experience, credibility and compliance with Standards Australia, Exotic Pools offer first class service to each of their clients. People want their living environment to reflect their own lifestyle and Exotic Pools understand this, obtaining a reputation of high standard workmanship, affordable creations and attention to detail. Often working with architects, landscape architects and designers to build pools and spas from their plans, they will listen to what you want, working with you to form the design concept through until the very end of production. Exotic Pools started in 1995, as a division of Ultracourts. Together they are able to offer a complete project package that often encompasses the construction of a swimming pool, tennis court and surrounding landscaping.